Sorry to hear that your back is still bad OH. Do you have a date for your rearranged appointment with the consultant yet RFJ? Cold here this morning - feels like -1C at the minute according to the Met Office. I'd like summer back please! Yesterday's lyrics - Can't Stop Now by Keane. Why: need to be logging a few more Kms, and hope the legs want to play. Hope the care home visits are fruitful, LMH. No you're right Dustin - more free time because I'll be running less miles - but not for a couple of weeks yet all being well. WHat: just over a mile streak saver, upped the pace it was good! why: Spurs going home tonight I need to leave early!! I do know the lyrics as I cant stop singing it now, love it. Very fitting!! Will be back to long sleeves and tights here too today LMH. What: either 6 recovery with strides or 10 miles GA - depends when I get out. Lyrics: for once I think yes.. I'm sure you know lots about marathons, Gobi! 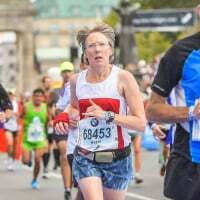 There are obviously lots of different ways to train for one: I have been involved with the training of three "good" marathoners in particular (2;16, 2:17, 2:20): all were very different in their approach but what they did worked for them, not least fitting in with their lifestyle and home commitments. LMH's approach, also, works for her with excellent results over the last few years. Long may it continue! LMH (and anyone else): I read "Eat and Run" by Scott Jurek on the plane. Interesting! Long runs and a plant based diet. Must find something to read for next week's flights. Enjoy the new home, Wabo! Unfortunately I need Andros, Zaha and Milivojevic to score (all in my fantasy team as Palace were playing twice this week!). Why: need to up the distance. Legs were tired initially but loosened up after a k or so. Very cold (hat, gloves, thick jacket). Hands never got warm until around 30 minutes. May go to the fitness suite later to put weight through the Achilles. I don't think that Gobi. Thank you Alehouse. I read Eat and Run a while back, interesting but I wasn't converted. I had a very enjoyable run thanks Wabo. Hope you enjoy this evening. No tights here Hazel - I am generally in capris unless there's deep snow - but definitely a cold start to the day and my run though it's warmed up nicely now. Hope work doesn't interfere with play too much. I didnt want the bloody training debate again. This is why I disappear so laters. Hope I didn't offend, Gobi! There was no intention to do so by any means! More importantly, is it the next duathlon qualifier at the weekend? Snow could even be an issue tomorrow we have a warning out now for it. I haven't read too many running books Ale, just P&D and the novel Race across America. Might be an idea to add some to my bookshelf. Will be interesting to see if we are singing the same song based on today's lyrics Wabo, I suppose I could cheat and check! Enjoy the football. 6 miles recovery with strides D&D at lunch having more or less given up on work due to a powercut, good I didn't do the 10 as it started pouring a few minutes after I got back. Hazel I bet we are, let you know when it is revealed tomorrow! Oh dear - what did I miss? Let's spread some love, ok? Nice excuse to leave work early, Hazel. Now, where is that fuse box …. Glad your run was good, LMH. Took a rest day yesterday as I must have slept funny and now I have a weird pain on the right hand side just under my ribcage. Almost like a permanent stitch. Had hoped a rest day would sort it but it hasn't. Bugger. Running today didn't feel quite right either. I just hope it's taper madness and miraculously disappears on Sunday as these things usually do. Checked the analogue bookshelf - the novel is called Flanagan's Run not Race across America (though that is what is is about). Author: Tom McNab. Ouch - I too hope that is taper madness Chicksta. I like the fact that we are all allowed to have and voice our own opinions, just worry if I think I've upset someone. It's taper madness chicksta - you'll be right. Hope power is restored Hazel. The lyrics are rather apt for those of us in the UK. I dont voice opinions because people get all defensive about their approach. I joked about you not following a normal taper as in my view your training is not normal. The fact is you dont normally follow a standard taper. I shall again drop off the forum as even in lighter moments it is obvious that I cant say anything without someone having to make a point. I wish you all the best with your race. I wish everyone else who posts on the forum a successful 2019. There will not be another response from me. A simple misunderstanding then as I was referring to my standard taper. Last hard: that! My legs ached. Cold out there too, got rained on a bit. Hazel hope you avoid the snow. Apologies again Gobi! A simple misunderstanding! I was actually trying to be supportive of you being a decent marathon runner and coach, whilst at the same time saying that LMH could train how she likes, plus what I said about different approaches work for different people! Let's move on and I will be disappointed if you don't stick around! Emz: I actually want Spurs to win, but preferably by something like 5-4! Be careful with those runs! And the cricket season is upon us, hence the snow and sleet! Why: went to the supermarket beginning with T on the way to the fitness suite. Came out and it was so bright and sunny I had a short run instead.